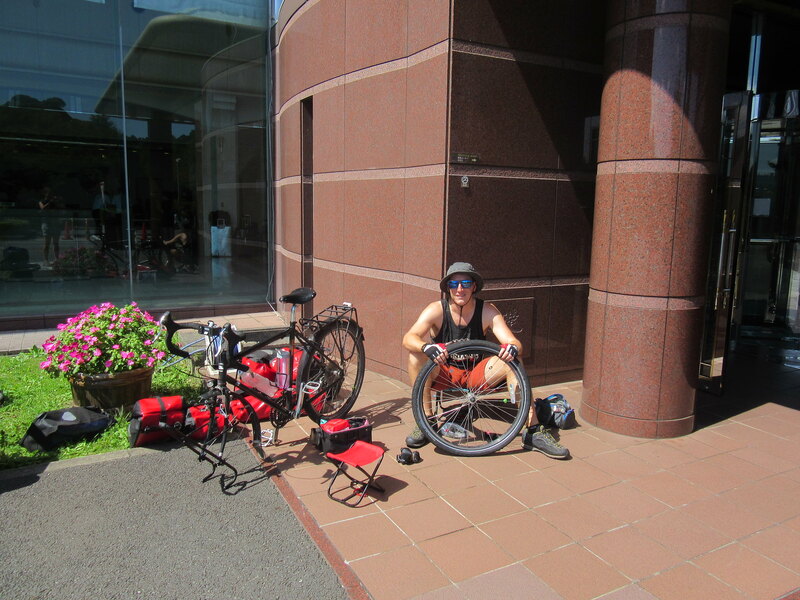 Our bikes were waiting for us when we got back into Tokyo on the 21st. The awesome Marroad Hotel at Narita Airport stored them for us for the 3 weeks we were in the UK, plus all our panniers, totally free of charge. Waking up jet-lagged on the 22nd, it was hard to get ourselves up and packed, but eventually we had everything arranged into our panniers and we were good to go. Leaving the hotel and loading the bikes, a group of Chinese tourists were watching us looking quite bemused, but saying words that sounded like encouragement. The sun was shining, we had an audience, we had our customary fist bump to start the day, and then… Clare’s front tyre was flat. We couldn’t find anything in the tyre and later checking the tube we couldn’t find a puncture so we assume the valve was knocked or had something pressed against it while the bike was being stored. Either way, we changed the tube and got underway only slightly later than expected. 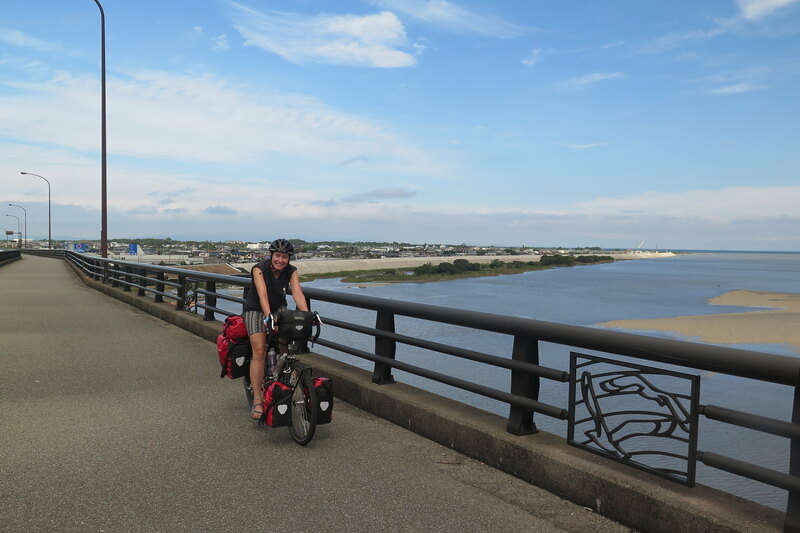 We were retracing our steps for the first 20km, back past the spot where we camped the night before we cycled to Narita three weeks before. 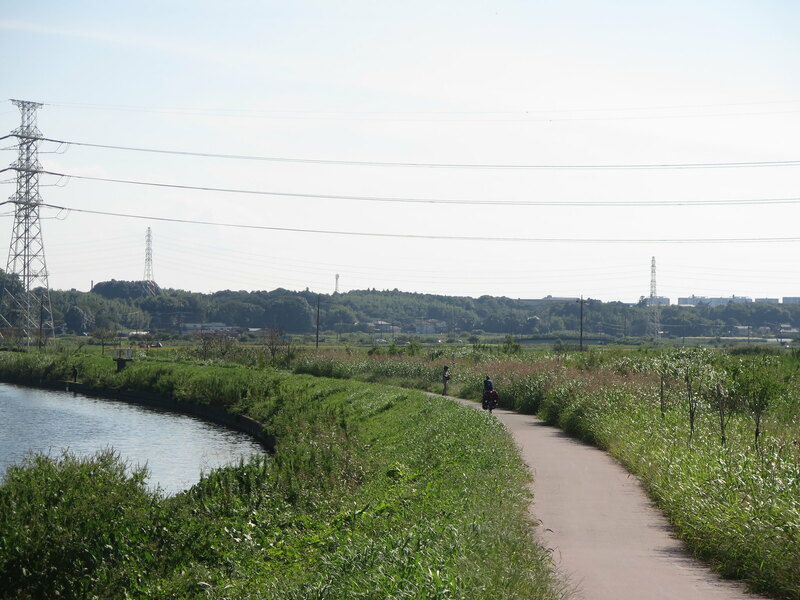 We continued around a lake and alongside a river heading generally west towards downtown Tokyo where we’d booked a hotel for the night. 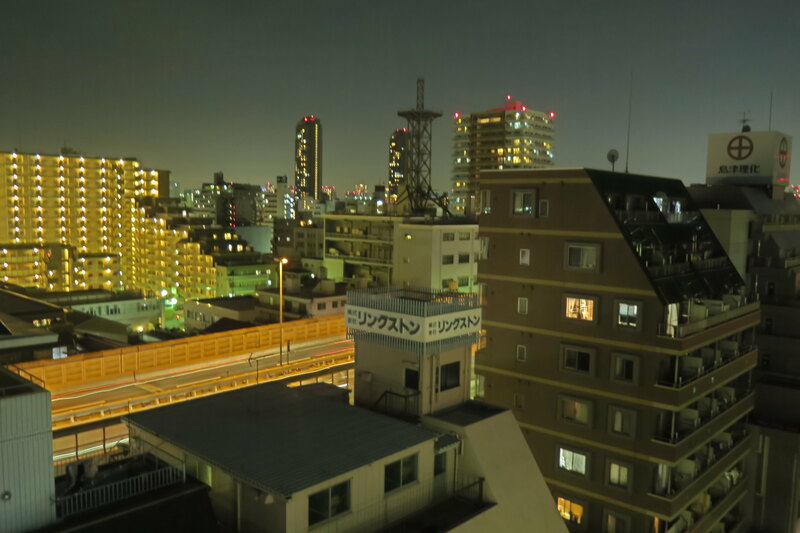 Inevitably, the open spaces and quiet roads soon came to an end and we entered the urban sprawl of Tokyo. We both were feeling quite spaced out thanks to the afternoon jet lag lull, so navigating and negotiating the traffic through the suburbs wasn’t much fun. Ironically, once we got into more central Tokyo, the cycling got easier as we were on wide pavements with cycle lanes. Arriving at our hotel after 68km, we grabbed some sushi for dinner and struggled to stay awake for a few hours before going to bed. 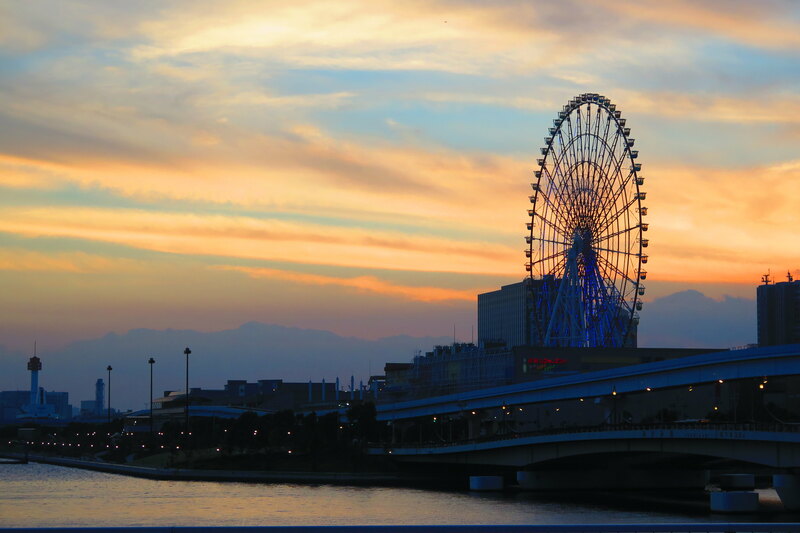 We’d decided to catch a ferry from Tokyo down to Tokushima in Shikoku. This means we can avoid the very urban stretch between Tokyo to Nagoya and on to Kansai, a lot of which we’ve covered before. 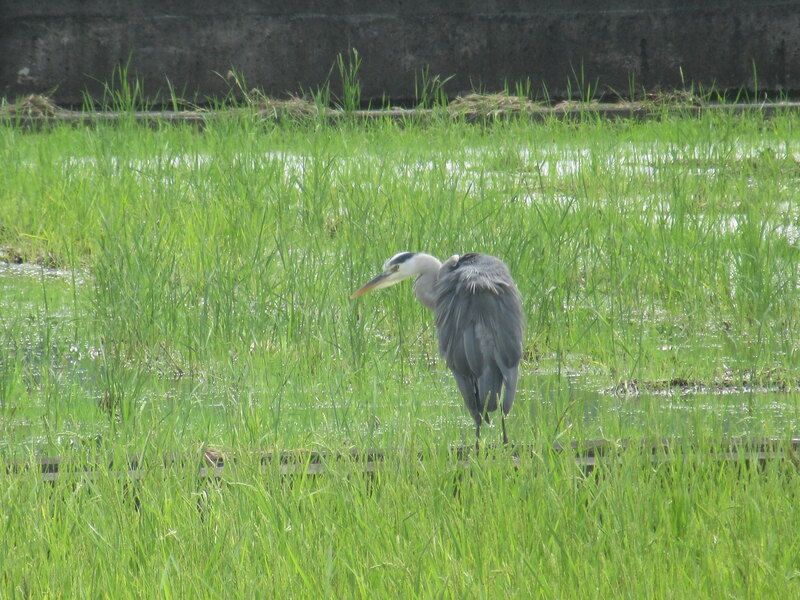 From Tokushima, we can take our time exploring some new areas on more scenic and rural roads. 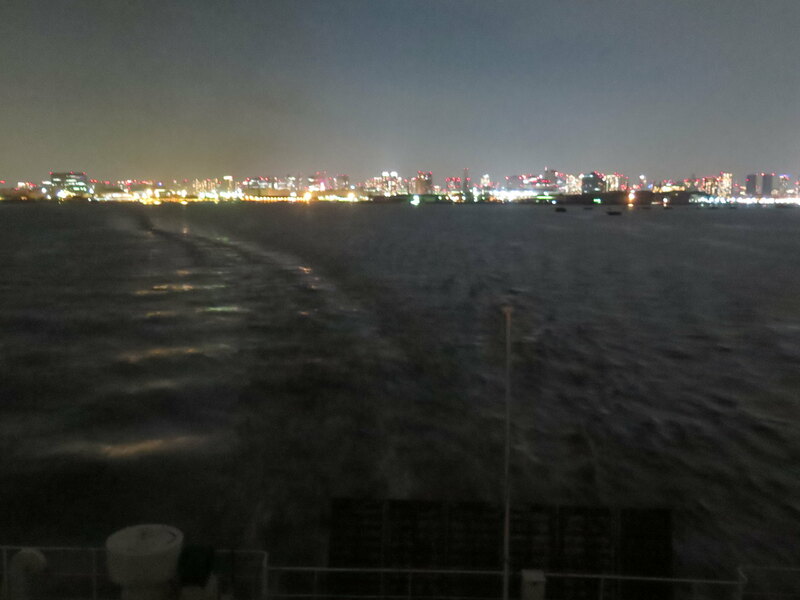 We took the overnight ferry which left Tokyo’s port on the evening of the 23rd. During our broken sleep on the boat, we were rocked by quite a rough sea and we could hear the rain pounding on the windows (portholes?) 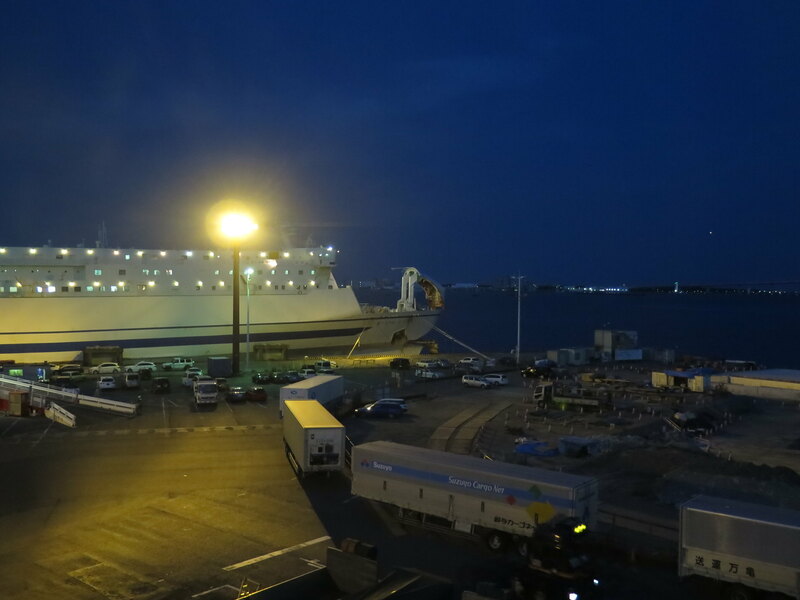 We hadn’t really checked the weather forecast, and the rain was still falling heavily when we docked in Tokushima. It was a unanimous decision to cycle straight to the nearest 7-11 for wi-fi, and then onto booking.com to book a hotel in the city for the night. Setting off the following morning the rain had stopped and the roads were starting to dry off. We headed south out of the city, joining route 55, the coast road which we’ll be following for the next few days, around to Kochi. We were getting back into our routine fairly quickly. Cycle for a couple hours in the morning, then coffee and a few biscuits. Cycle a bit more and then find a nice spot to have lunch. The roads were good and mostly flat next to the sea, with a few diversions inland through beautiful hills covered with thick bamboo forests. Although our legs aren’t as strong as they were after our 3 week break, the climbs weren’t too taxing. Nowhere near as bad as the early stages of cycing in Aomori. 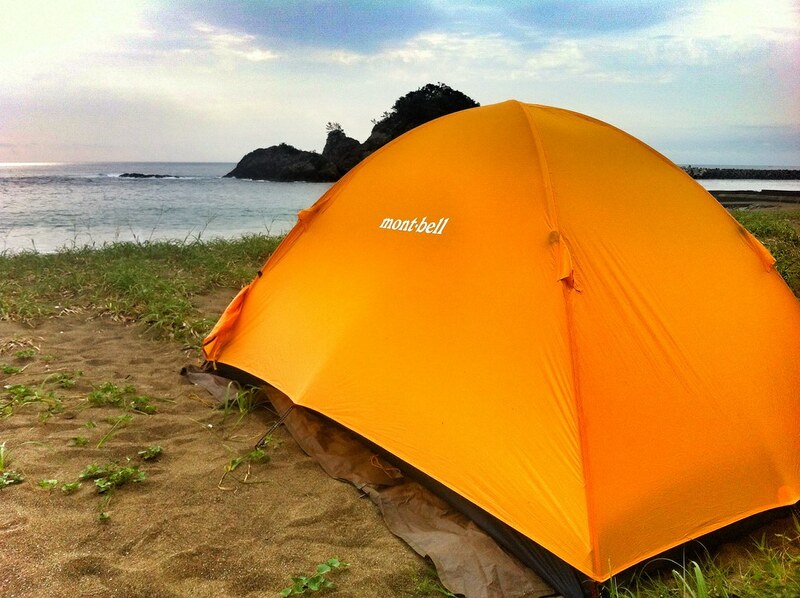 We camped on Ohama beach that evening, in the town of Hiwasa. The beach is known for being a turtle nesting area, although the hatching season is in June so I don’t think we were disturbing anything. 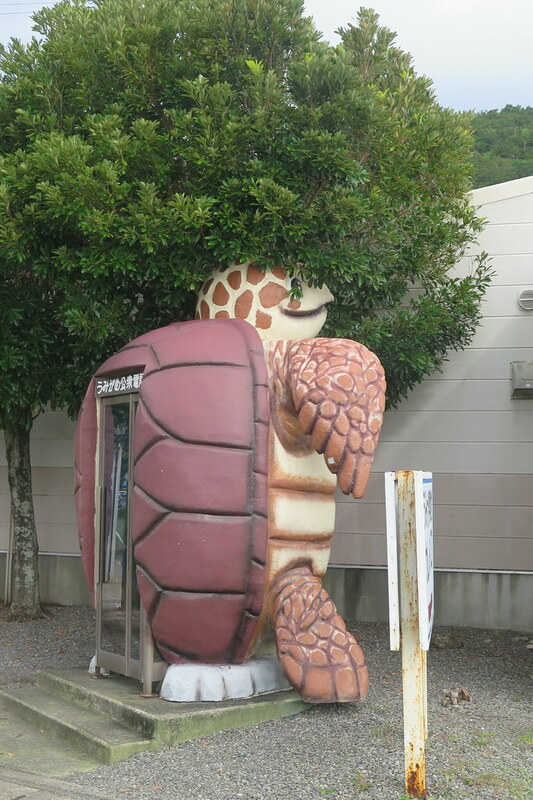 The town’s mascot is a turtle and even the phone box and toilets next to the beach had a turtle theme. The waves were pounding (I think there’s a typhoon somewhere further south) and the weather looked slightly sketchy, but other than a few spots of rain, we stayed dry cooking our dinner before getting into the tent. We didn’t sleep particularly well, maybe its the jet lag, or maybe it’s just going to take a couple of nights to get used to sleeping in a tent again. We’re on the east coast, so woke to the sun shining into the tent from the ocean. It was a promising start, but the clouds rolled in and grey skies returned by the time we were having our breakfast. There was a group of skim boarders on the beach making the most of the waves so we watched them for a while before packing up the tent and setting off. 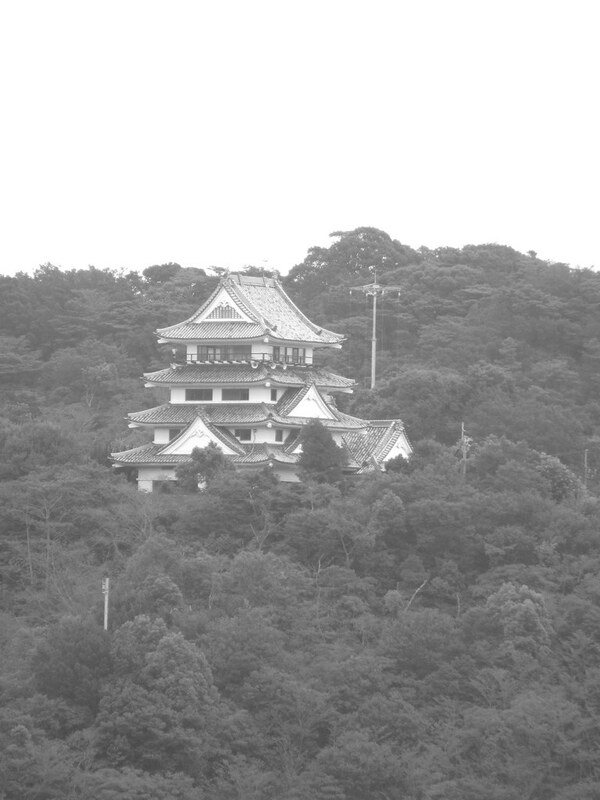 Shikoku is famous for the 88 temples around which many people make a pilgrimage, usually on foot and usually penniless, relying on the kindness of strangers. Even in the couple of days we’ve been here, we’ve seen 4 or 5 pilgrims walking alongside the road with the traditional round hat and wooden staff. 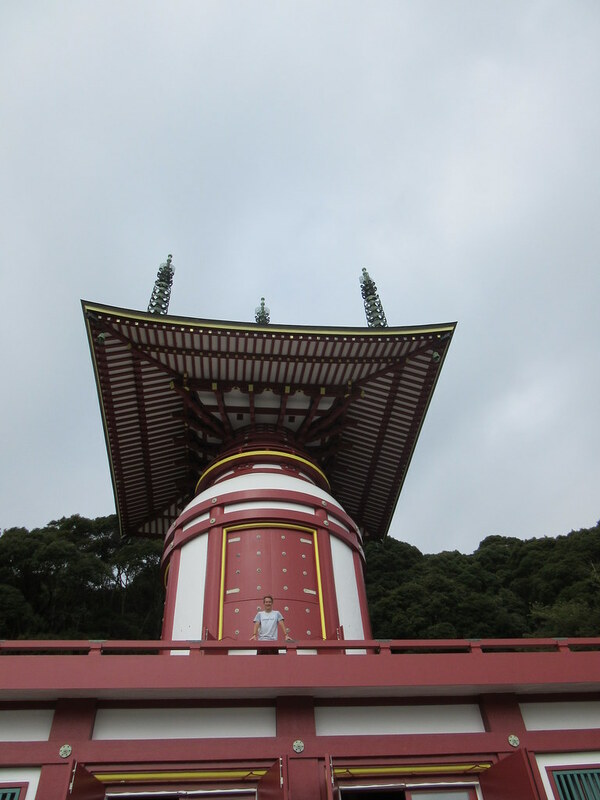 One of the temples on the pilgrimage, number 23, I believe, is in Hiwasa, so we went for a quick look around before setting off for the days cycling. We didn’t have too far to go. 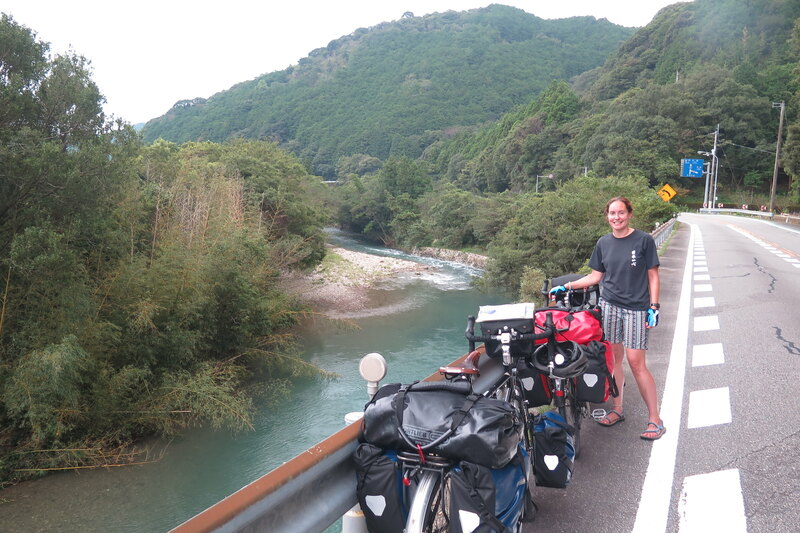 We’d arranged to stay with a Warm Showers host, Tomoya, in Ikumi just 40 odd kilometres down the road. Even though it was overcast, the roadside thermometers were reading 30 degrees C. The views were similar to the previous day, beaches and wooded hills, although the towns had turned to villages and the roads were a lot quieter. We stopped for our morning coffee next to a river. 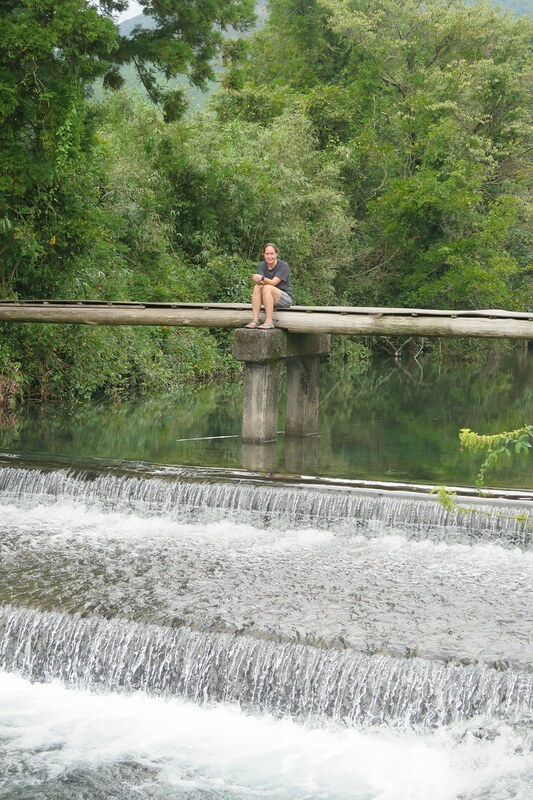 Sitting on the bridge, the crystal clear water flowing under us was way too much temptation for me on such a hot day. We ate our lunch sitting on the beach watching the surfers. 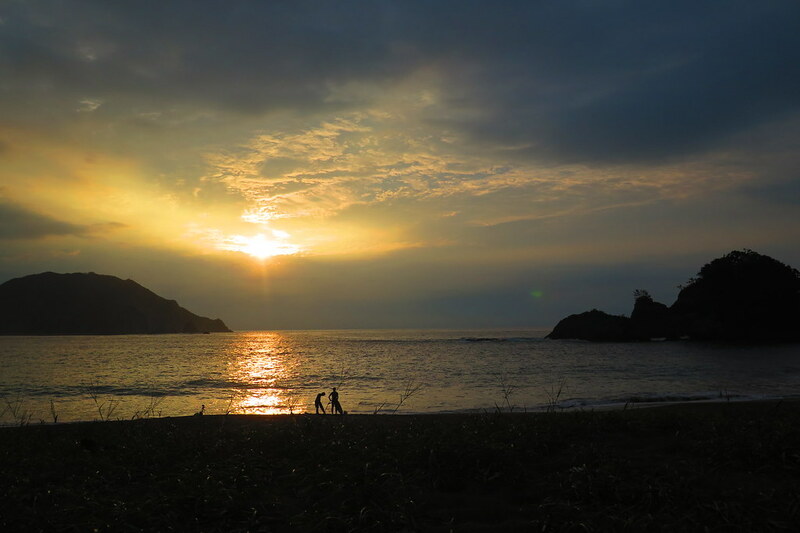 This coastline, facing the Pacific, has some of the best surf in Japan. 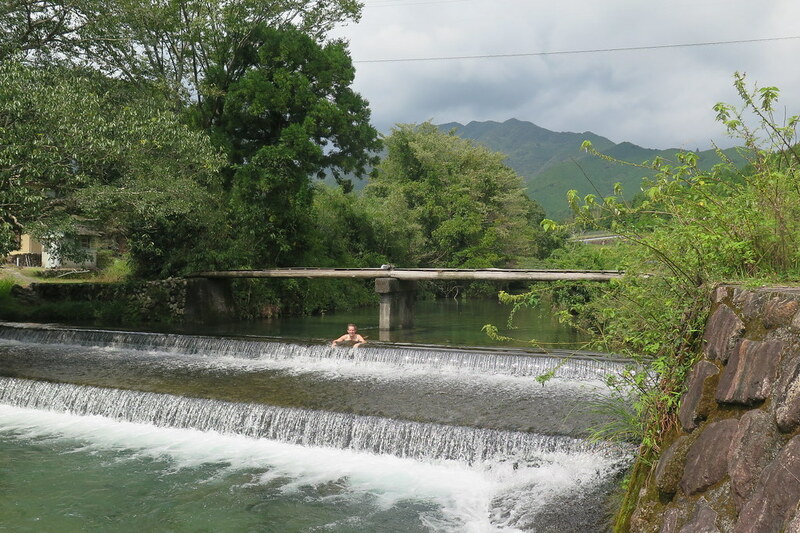 Our final stop, Ikumi, is a tiny town, with only a couple of small guest houses and surf shops. We arranged to meet Tomoya on the beach mid afternoon, and we followed him back to his house and farm where he grows organic tomatoes and other veggies. 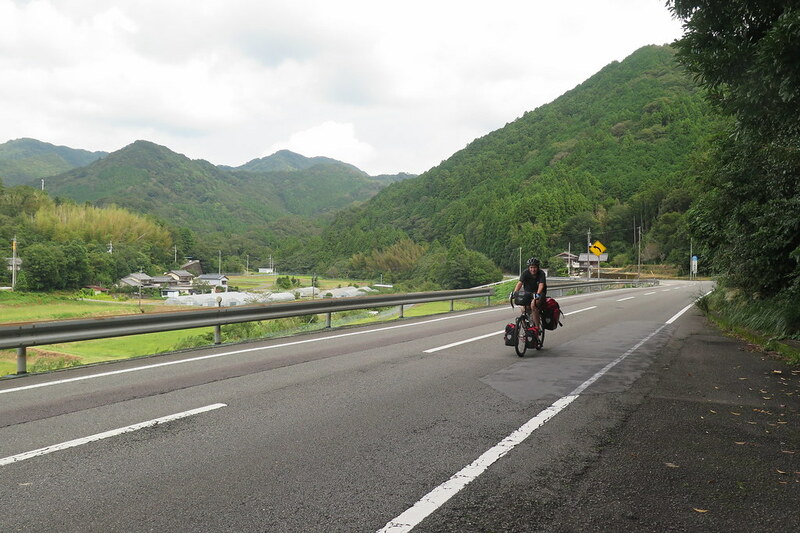 Tomoya left his salaryman life in Yokohama many years ago and travelled the world by bicycle before settling into the farmer lifestyle in rural Shikoku. He hosts cyclists through Warm Showers as well as WWOOFers who help on his farm. 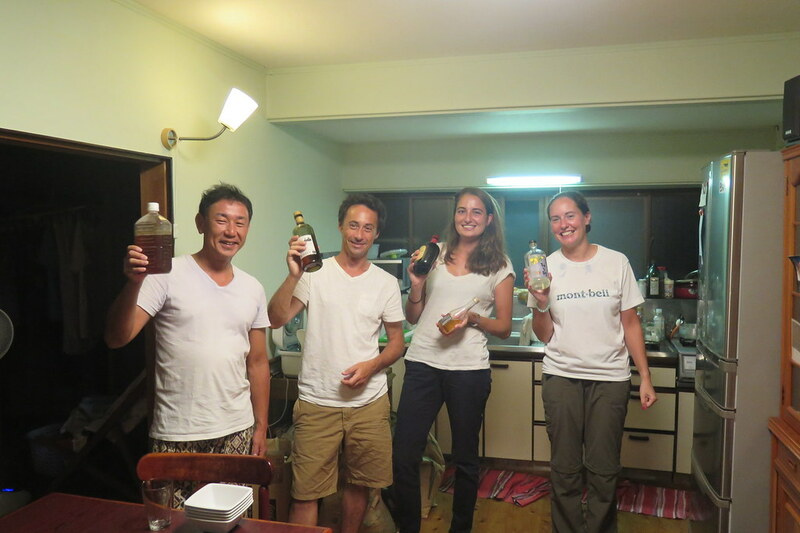 We had a really pleasant dinner, washed down with copious amounts of alcohol, Tomoya’s other passion, with a couple of French backpackers who are working temporarily on the farm. 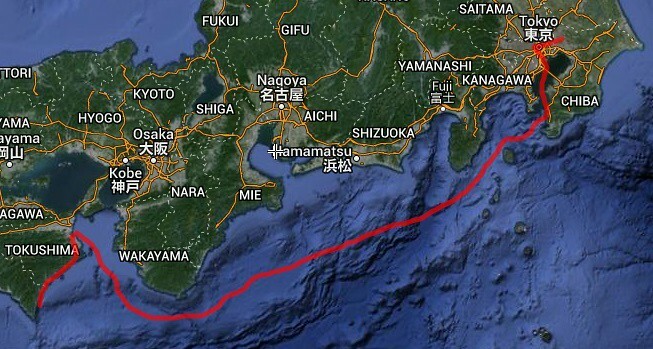 From Ikumi, we’ll follow the coastline south and then west around Shikoku, and then decide whether to go back over to Honshu, or over to Kyushu. Now that you’re back on the road, do you need us to send you live updates of the Rugby World Cup?! Haha, I don’t need the news from the England – Wales game, thanks! Been really enjoying your posts. Good luck with the rest of Japan. Cheers mate! Sorry we didn’t have time to catch you in Tokyo!